She is beautiful and funny and by far the reigning champion of craziest in our home. 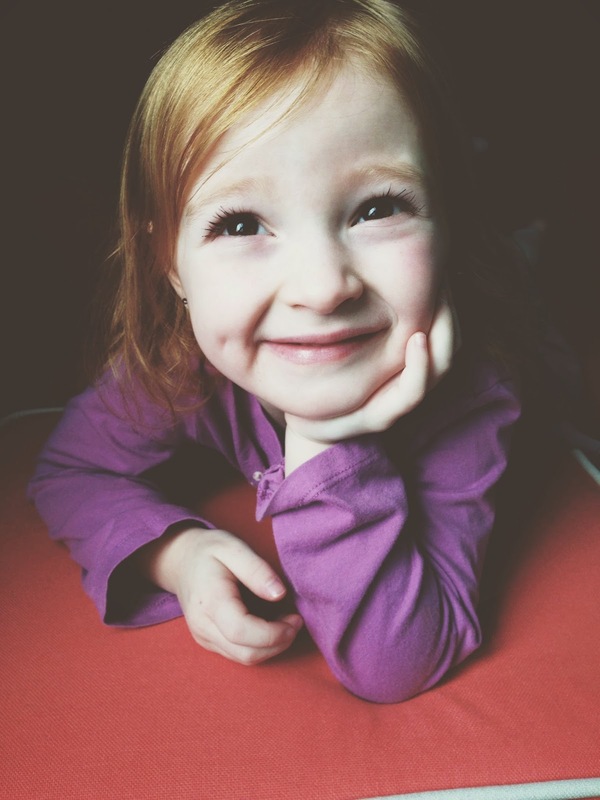 She is four years old and filled with so many complexities. She has overcome so many fears through great answered prayers. She leans towards how much she can bend the truth, but I deeply love speaking truth into her and seeing God drop nuggets into her heart. She was the first one to set the three names trend. We knew the moment I found out I was pregnant with her what her name would be. Hedge was certain she was a girl and he said I don't care what her name means but somewhere in her name it has to mean "gift." One of her names does. Her first name means God is my oath. Her third name was dropped in my heart from a street sign in the sunshine state a few months before she arrived, I looked it up and it rang true in my spirit. it means one who is a psalmist. She was our first miracle without our mindful pursuit. We spent a few years trying with our first born, we tried for our second born and lost that life, then we were led down the road to IVF with our twins. The news of her arrival came at a very unexpected time in our life. Hedge was working a full time hourly job. We in a season of waiting on direction. We had our three little people that kept us busy all day... I was nursing the twins and the idea of a fourth child was something I thought we would be blessed with through adoption someday. We knew from the day we brought our twins home, we were fulfilled. We weren't going to try to conceive anymore but we also had no intention of preventing the Lord from blessing us. We didn't think conception without intervention was apart of our story. I love how God will impress your heart to pray for something and you actually don't realize what you are asking for. We stopped praying for our future and what was next and began asking God for Him. Just to be washed in his love. To be filled with a desire to pursue him. We had been in full time ministry for almost a decade at this point... from student to staff, and everything in between. We had sold our lives out to the call of ministering to students and we loved it! But then there we were with three little people to care for, and barely enough money to buy food. We needed Jesus more than we needed the next ministry to pour our lives into. A year had passed from the time Hedge had lost his salary as a young adults pastor. We had prayed and waited, and he applied here and there but nothing was happening. We had friends in ministry at different places around the country that were encouraging us to apply to positions in their churches but for the first time in our married life the idea of taking a position at a church for a paycheck didn't seem right. We need to let the God we loved teaching others about, teach us about faith in him with no title or position. Just us & him. I remember waking up one day from a nap and thinking... we are waiting on the lord with how to fully provide for our family but at some point we have to step out in faith and actually trust that our decisions will be directed by him. I was like Hedge... "God loves us TOO much to let us make a bad decision, and really if we do, He will guide right back to where we belong, because we love Him too much to disobey." So that afternoon we signed up for some classes at a local community college by where we lived. We had a ton of hands on training and experience from our field of ministry but we had no tangible degree to show we had goods to offer a work environment. So I signed up for a full semester of classes, and Hedge signed up for a semester to get his EMT basic so he could go to school during the week and work 12's on the weekends. I was excited and hopeful that God was leading us! A few days after we had both signed up for classes, I was putting Fitz to bed and I had a flash of the night I found out I was pregnant with him. I came out of the room and I said "go buy a pregnancy test". Hedge looked at me like I was nuts. He said "why in the world would you think you need one?" For the first time in our marriage we were actually NOT trying to get pregnant and I was nursing babies. I said "just go get one." Within 30 minutes our lives had been flipped upside down. WE WERE HAVING A BABY without out any intervention! I mean every child we fought for seemed like such an answer to prayer and such a miracle of life. But to experience a pregnancy by surprise was unbelievable to my heart. I of course immediately went all Saul-like and consumed myself with fear and worry. I was sure I was going to lose her. Faith is a simple and deeply profound act. To believe what you can't see. I didn't lose her. She is here and she is a giant piece of my heart that breathes and walks around on this earth. I see God doing so much in and through her. Her arrival is pretty funny... but I will save that for an actual post. She entered this world 6.4 lbs with a set of lungs that were only quieted if I would sing psalms to her. Its funny to me how much she looks like the twins. I think that genetic party was a gift from God to her grandmother (my mom), she was so surprised by the twins being red heads that she would make jokes that the specialist doctor switched our embryos with some other peoples. Well God made it known to all that Hedge and I are masters at making gingers with brown eyes. We are clearly born in America though because we have a little bit of everything in the sibling clan. Bizzy came at a time in our life that we saw God's blessing all over our life. Her news actually encouraged our faith that God was blessing us because He saw us faithful. Her arrival showed us that there is no ladder in life to things in order, she came when all things in our life looked like we were just this twenty something couple with a bunch of kids and no way to take care of them. He is worthy of our trust. He longs to lead every detail of our life. She helps me see that all the time.